The constituency of Setiawangsa northeast of the city centre is a serene, high-end district just 15 minutes away from the KLCC. It is even closer to Ampang. The neighbourhood of Taman Setiawangsa makes up the entire constituency and spans 257 acres, including a hill. Setiawangsa is divided into the mixed commercial and residential district at the bottom of the hill, the residential area of Bukit Setiawangsa on the hill slopes, and the new neighbourhood on the hill's peak, Puncak Setiawangsa (Setiawangsa Peak), which was developed in the mid-1990s and which has stunning views of the city below. 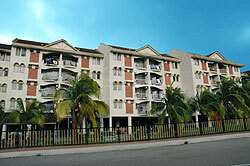 The district has good residential areas with well-maintained infrastructure, with good roads, a football field, two schools, a community centre, the Muaz Bin Jabbal Mosque and several real estate developments, such as resort-style condominiums and low-rise complexes and the Setiawangsa Business Suites. There are lots of places to eat in the district, from branches of popular restaurant chains to local mamak stalls and eateries. A branch of the Aeon AU2 chain of shopping centres and Jusco supermarkets opened in Setiawangsa recently too.